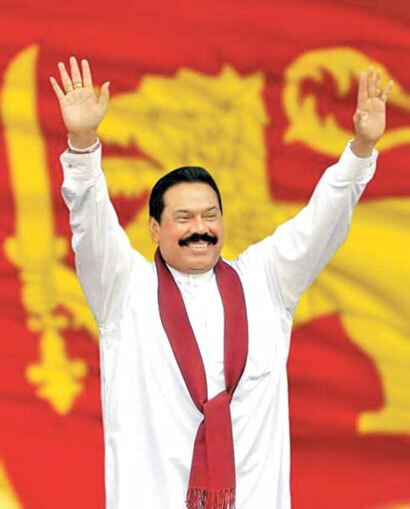 President Mahinda Rajapaksa completes 43 years in politics today. He was 24 years, when first elected to Parliament as an SLFP member, from the Beliatta electorate in 1970. He was then the youngest Member of Parliament and represented the same electorate his father did from his first election in 1947 and several subsequent polls till his death in 1965. Born on November 18, 1945 in Weeraketiya, the second son of six children of a famous political family of the South, it was destiny that drove young Mahinda to tread the political path first taken by his uncle D M Rajapaksa and by his father D A Rajapaksa who played a key role in founding the Sri Lanka Freedom Party after joining hands with S W R D Bandaranaike resigning from the D S Senanayake government to steer the nation on a righteous path and enthrone the common man. In 1973, he entered Law College and was responsible in the formation of the Sri Lanka Freedom Party Lawyers’ Association. After taking oaths as a lawyer, he did his apprenticeship under well-known legal luminary Daya Perera. He lost his parliamentary seat in the landslide victory of the UNP in 1977. But he was closely in touch with the people and their needs and also the development needs of the southern region while practicing law mainly in the southern town of Tangalle from 1977 to 1994. In the parliamentary election that followed in 1989 (after the UNP had extended its term by six years through a questionable referendum) he was re-elected to Parliament from the Hambantota District under proportional representation in 1994. Winning the 1994 elections, he served the country as the Labour Minister until 1997 and with the Cabinet reshuffle he was appointed Fisheries and Aquatic Resources Minister. In 2002, he was elected the Opposition leader and on April 6, 2004, he was appointed Sri Lanka’s 13th Prime Minister. He was elected the 5th Executive President of Sri Lanka at the Presidential Elections held on November 17, 2005, a day before his birthday. The leadership given by him to defeat the terrorism of the LTTE, and his restoring the unitary status of Sri Lanka, with the assurance of Constitutional Rights to all citizens led to the University of Colombo conferring on him the degree of Doctor of Laws in 2009. He was elected as President for a second term winning the election with a massive majority in 2010. Loyalty to principle and party has been the hallmark of Mahinda Rajapaksa’s political philosophy. In this he followed the example set by his father, especially in the loyalty he showed to the SLFP which he helped found and to the late SWRD Bandaranaike and Mrs. Sirimavo Bandaranaike whose leadership and politics he accepted, and was deeply loyal to Mrs. Bandaranaike and the SLFP, the leader and party that brought him to Parliament. His loyalty and attachment to the SLFP, which was responsible for the ups and downs in his politics, just like his father’s, has kept him with the party from the time he was a youth activist of the party as a student, and throughout his political life as Member of Parliament, Cabinet Minister, Leader of the Opposition, Prime Minister and now as the country’s President. best wishes for your life & your politics.thank you sir we thankful for all those things you gave us.we are now free. The smell of freedom which permeates every corner of our Buddhist Nation is due to the victory achieved through the relentless war against Tamil terrorists. President Rajapaksa provided leadership for the “mother of all wars on terror”. President Rajapaksa must remain the leader of our Sinhala Buddhist Nation for the rest of his life. May you live long Sir. May the Triple Gem bless you.